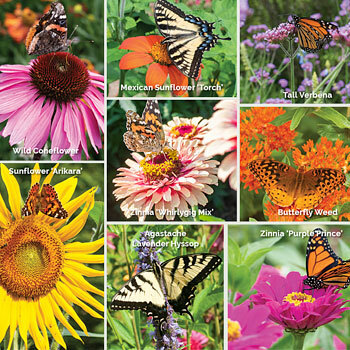 Large expanses of lawn, called "green deserts" offer little for butterflies Create magical gardens that attract and nourish butterflies with nectar-rich flowers in jewel tones that you are sure to love. Observe these beauties as they float from flower to flower in your sunny garden and know you are helping them thrive! Success in gardening starts with well-prepared soil. Remove existing vegetation and cultivate soil, incorporating 2” of organic matter, such as peat moss, rotted manure or compost. Rake the bed smooth and water gently to settle. A soil test, offered by your state Cooperative Extension Service will guide you in amending your soils for your needs. Site your garden in a sunny spot that receives at least 6 hours of sun a day. Mark out areas for sowing seeds, using sand, lime or score with a stick and scatter seeds thinly and rake into the surface, firming with the back of a hoe. Water gently with a fine spray, keep evenly moist until seedlings emerge. Please refer to specific instructions on each packet. Ban pesticides of all kinds. Choose a sunny location and sow groups of flowers, not single specimens. Butterflies need warm temperatures to enable them to stay active, as they are cold-blooded and cannot internally regulate their body temperature. They will bask in the sun to keep their bodies warm. It is a good idea to have partly shady areas as well, like trees or shrubs, so they can hide when it's cloudy or cool off if it is very hot. Provide shelter from winds, a horseshoe shaped garden with native shrubs will offer cover; add weedy areas for butterfly larval food source plants. A muddy puddle will provide needed minerals and add fruit such as previously frozen bananas to attract diverse butterfly species. Young seedlings should be watered regularly. Once the plants are mature blooming specimens, water only during prolonged dry weather. A weekly slow soaking is best delivering 1” of water to the soil, and keeping the foliage dry. Deadhead for continued bloom.